Operator: Ellerman Lines Ltd/Ellerman City Liners, London. Port of registry: Hull. Built: 1968 by Henry Robb Ltd, Leith, Scotland. Yard no. 499. Main engine: six-cylinder, four-stroke Mirrlees National ALSSM6 of 2,580 bhp. Speed: 13 knots. Built for Ellerman’s Wilson Line Ltd, Hull as SANGRO. 1974-renamed CITY OF ANKARA (as photo). 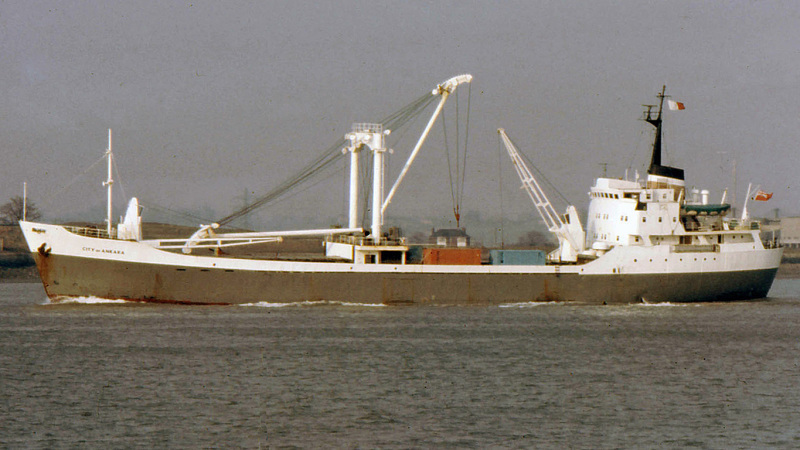 1979-sold to PT Abadi Inti Lines, Jakarta, Indonesia, renamed REZEKI. 1995-sold to Sejatera Bahtera Agung, renamed KALIMANTAN PACIFIC (Indonesian flag). 2007-to breakers at Chittagong, Bangladesh 30/5. This photo has been shown 422 times since it was added to the site.